I am surprised that there is only one value for the path the road takes. Does the road have a single vanishing point and all lanes point to it? Does it really calculate a curve for every lane in real time? How are the number of lanes, spacing information and scenary data for the section stored? e.g. in the picture shown there are 3 lanes, a bit of land with palms on it and 3 lanes on the other side but on other segments there are just 3 maybe even 4 lanes. I wonder if they had access to the original source code for the Saturn and GBA Versions. The path is represented in data as four separate values, but ultimately a single point is derived from these. 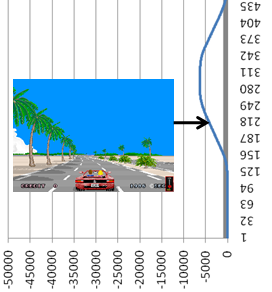 The number of lanes is stored separately and set by CPU 1. So each chunk of road will be assigned a width, and then the code gradually alters the width as necessary. A width beyond a certain value automatically splits the road into two lanes. The GBA version, even if they had access to it, wasn't used directly.